Compact and easy to use, the Next Generation Hose Meter allows you to monitor the volume of water you are using. Attaches to your hose faucet or a trigger nozzle. Shows current and accumulated volume of water used. 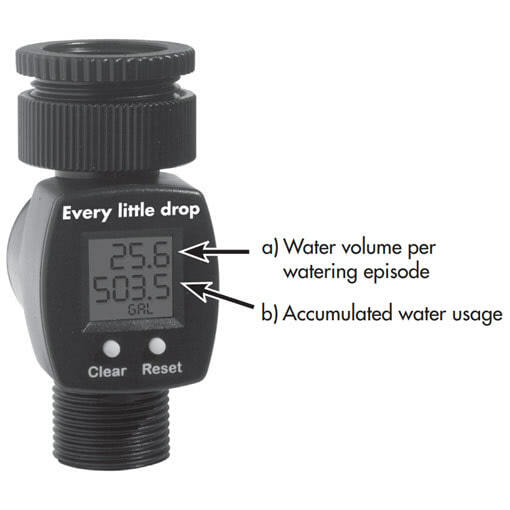 Compact and easy to use, the Next Generation Hose Meter allows you to monitor the volume of water you are using outdoors. Attaches to your laundry/outdoor faucet, no fittings required. Can be connect to a trigger nozzle. Can be used for up to 999 gallons before resetting. Your Next Generation Hose Meter comes with batteries installed and fittings attached so you are able to immediately screw it on to your outdoor faucet. When the water flow commences both a) and b) will show the volume of water being used. To reset the water volume used in the current episode (a) to zero, press “Clear”. Note the accumulated water use reading (b) will continue to accumulate until reset. To reset a) and b) back to zero press “reset”. The Next Generation Hose Meter will measure up to 999 litres or gallons before resetting. The Hose Meter has been set to default to gallons. To change it to litres hold the “clear” button down for three seconds and release. A dark dot will appear on the left hand side of the screen and GAL will flash. Select LIT by pressing “reset” and press “clear” to confirm setting. The screen will fade out in 30 minutes if there is no water flow or button activation. 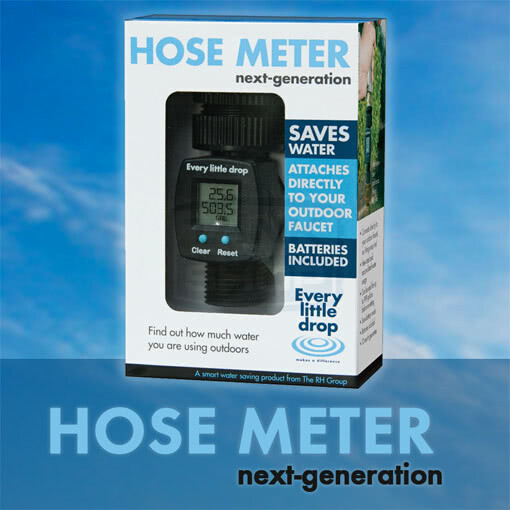 The Next Generation Hose Meter uses a button battery (CR2032). For optimum performance it is recommended to replace this battery every 12 months. The Next Generation Hose Meter is designed for residential use only. Accuracy of the Next Generation Hose Meter is expected to be above 90% however this can vary depending on a number of variables. This product is guaranteed by manufacturer for 12 months from date of purchase.